The Miller Tanner difference is our people. That’s why we want to introduce you to our team of superstars that brings our corporate meetings and events to life for our clients. 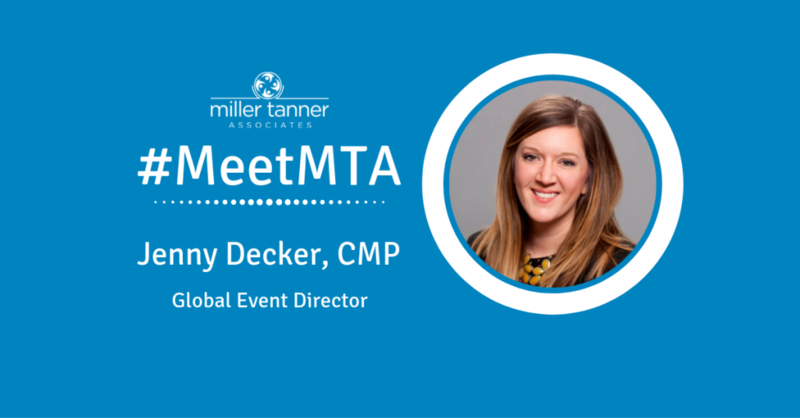 Today we introduce you to Jenny Decker, CMP, Global Event Director. Jenny brings her extensive background in event management with expertise in conference and exhibition planning. As a Certified Meeting Professional (CMP), Jenny is a valuable asset to our team, planning both clinical and commercial events for our clients. Tell us about your current role with MTA? I am a Global Events Director and handle both clinical and commercial events. I was the meeting/conference manager for a behavioral healthcare company that hosted 4 national conferences each year (between 500-2,000 attendees). Traveling to places you might never get to visit otherwise and working with people from all over the world (from colleagues to vendors and hotel employees) is the best part of my job. With MTA, I got to go to South America for the first time and loved visiting Santiago, Chile. It was a unique experience and hope to go back again! It was my first trip to Philadelphia with MTA. I landed just in time for the Super Bowl parade in honor of the Eagles’ win – so you can imagine what the city was like during that time. I joked and thanked my MTA teammates for organizing such a large event for the arrival of my first meeting! When did you receive your Certified Meeting Professional (CMP) credential and what was your reason for pursuing this designation? In 2014, I felt like it was just the next step in my career. The CMP isn’t an easy credential to achieve so I knew that having it would show my dedication to the industry. Less is more. It’s something I struggle with but, especially when you travel internationally, having less to keep up with is definitely a plus. Even though I travel with work, I still love to travel with my family and friends. I have a two-year-old who keeps me very busy but I hope that my love of travel rubs off on her and that she enjoys seeing new places as much as I do. Visiting the “local” places instead of always going straight to the “tourist destinations” is my favorite part about traveling. I think the best way to teach culture, empathy, and kindness is to step inside someone else’s world and experience their surroundings, even if only for a short time. What do you enjoy most about living in Tennessee? I enjoy the lake, that family is close by, and that I can get to Nashville quickly! There are a lot of companies who plan meetings and a lot of people who coordinate events. I’ve worked with and for a lot of them. Miller Tanner stands right with them in that we can coordinate major events seamlessly, and on a budget. But, to me, Miller Tanner goes beyond the to-do list and boxes to be checked; we know how to bring together a variety of resources and people to realize a greater vision. We understand what it means to work with others to help a business grow – our role isn’t one dimensional. Events have strict parameters, budgets, guidelines, restraints, and obligations that need to be handled with tact and experience. But they are also reliant upon vendors, colleagues, and even volunteers which demands an approachable, agile spirit. The people I get the pleasure of working with at MTA are exactly that. And that is what makes us stand out.